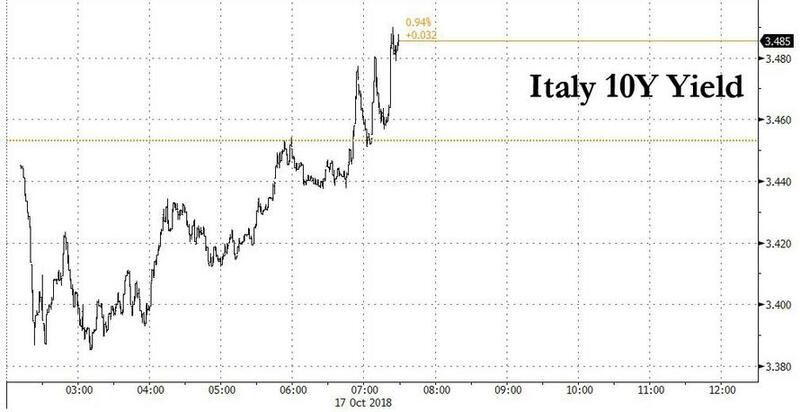 After starting off strong, Italian 10Y Yields have leaked wider all morning after a senior government official said on Wednesday that Italy’s 2019 budget may be rejected by the European Commission and a credit rating downgrade is also possible. "Let’s say that the premise is there" for the commission to start an infraction process over the budget, Stefano Buffagni, cabinet undersecretary for regional affairs, said in an interview with Radio Capital cited by Reuters. “Premier (Giuseppe) Conte is going to the EU to explain the motivations” behind the budget, he added. With Moody’s and Standard & Poor’s due to review Italy’s credit rating this month, Buffagni said a downgrade “can’t be excluded and we must be ready” in case it happens. He added, however, that he did not think a downgrade would be justified because “Italy has very solid economic fundamentals”. Meanwhile, Deutsche Bank economists said they think that Italy is squarely on a collision course with the European Commission, whose President Juncker said yesterday that there would be a “violent reaction” from other euro area countries if the Italian budget were to be approved. The Commission has two weeks to decide on whether to ask for budget revisions. Nevertheless, Italian assets gained yesterday in the first trading session since the government finalized the budget plan amid the broad market euphoria. The FTSE-MIB gained +2.23%, pacing gains in Europe, and 10- year BTPs rallied -9.3bps, however much of this move is being reversed on Wednesday. Partially this reflected the broader risk-on sentiment yesterday, but it may also have been a reaction to a new poll showing Five Star + Northern League support at 58.6%, still a majority but at its lowest level in over six weeks.